Google is all about giving the users what they want. The users have spoken and mobile comes first! We all know that Google has the ability to see an immense amount of data from its 1.17 billion users. Mobile-first indexing is Google’s response to the behavioral trends of its users. It has become clear to Google that they need to continue making the web more mobile-friendly. In this post, I will go over the basics of mobile-first indexing and give you an idea of some next steps that you should consider taking. According to Yoast.com, mobile-first indexing means that, “From now on, Google will base what it places in the index based on the mobile version of your site, whereas they used to index the desktop version of your site first.” Going forward your mobile version will be considered the primary version of your website. The way the pages on your website get indexed is when Googlebot, (also called a spider) crawls your website and discovers your pages. Those webpages will then be added into Google search. If you had Steck Insights build your website, here is where you can take a deep breath. We use WordPress and for most WordPress sites, mobile-first indexing will have a minimal effect because we build our sites to have a responsive design. Having a responsive web design, means that your website provides an optimal viewing experience across a wide range of devices, from mobile phones to desktop computer monitors. We take responsive web design very seriously. Below is the first picture you will see on our website and it is a great example of a responsive web design. 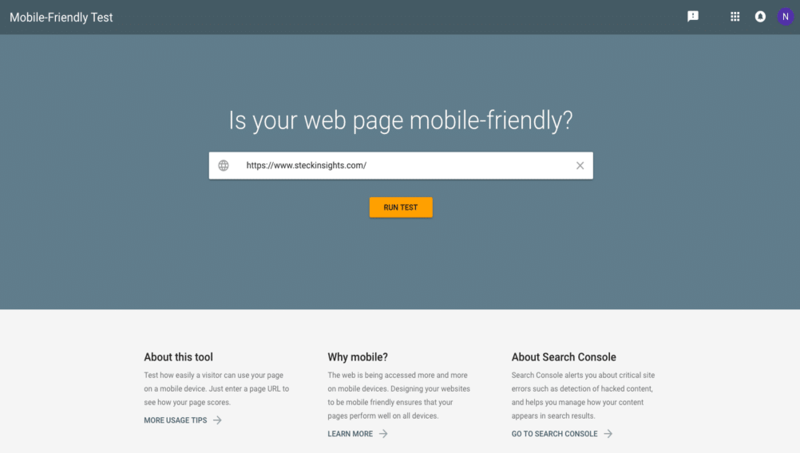 If you did not have Steck Insights build your site or you just want to be positive that the mobile-first indexing change will not affect you then follow the steps below. It is going to be hard to rank if your site is not mobile-friendly. Lucky for us Google has a mobile-friendly test that you can run. This test will take you one minute to do, simply plug the URL for your website into the test. Click on “Run Test” and then wait for Google to analyze your website. After about a minute or so you will receive your results stating whether or not your website is considered mobile-friendly by Google. Here is the link to Google’s mobile-friendly test below. Next, put yourself in the shoes of a user accessing your site from a mobile device. Make sure that you have mobile friendly copy, use short sentences and compact paragraphs. Also, use a font on your website that is large and easy to read. Explore your website on your mobile device and really think about it from a new user’s perspective. Is it simple to navigate, are the buttons big enough to tap on, is your content easy to read and last but not least does your website load fast? Let’s talk a little more about that last question, site speed. Google has made it known that site speed is a ranking factor. According to an article written by thinkwithgoogle.com, around 70 percent of the sites they analyzed took more than 7 seconds to load on mobile devices, which is far too long. The article goes on to talk about how they trained a deep neural network – a computer system modeled on the human brain and nervous system – with a large set of bounce and conversion data. This system had a 90% prediction accuracy. Here are its findings when it comes to site speed and how patient or rather not patient humans are. If you did not think about your website’s site speed before I hope that you see its importance now. If Google is telling us something is important then we need to listen. Below is a link to a website called gtmetrix. 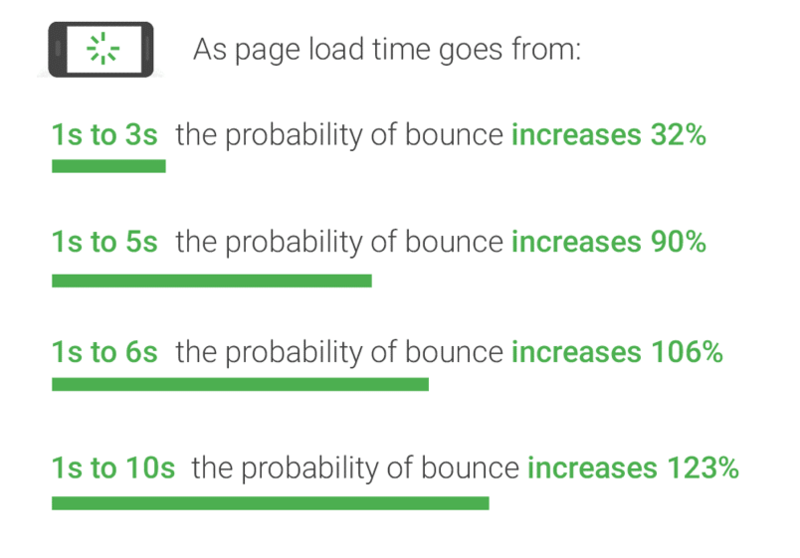 If your full loaded time is slower than you would like, consider reaching out to us to optimize your site speed. We would love to take a look at your site and give you a free estimate. We have taken many sites from above 20 seconds and dropped their fully loaded time to 3 seconds and under. 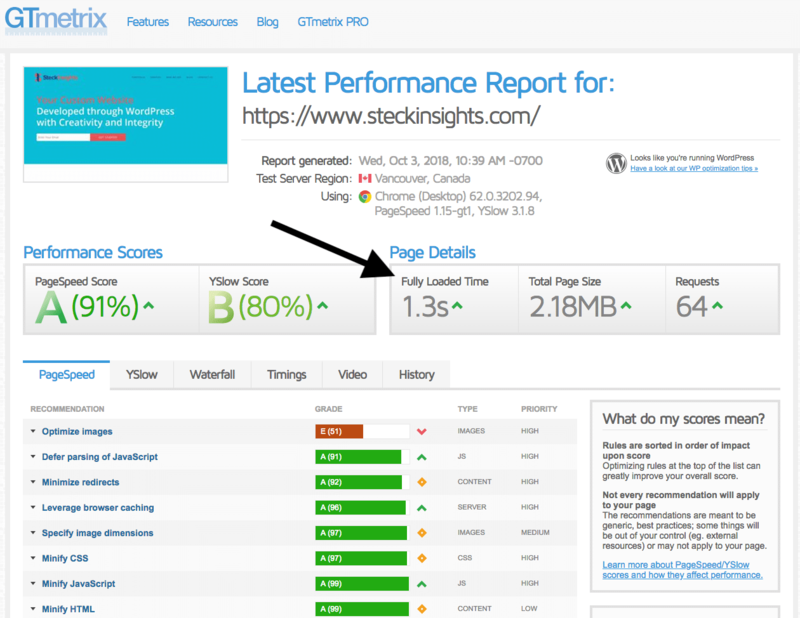 Steck Insights has a fully loaded time of 1.3 seconds. GTmetrix will give your site a score and some helpful tips on how you can optimize your site. As you can see in the screenshot below I have some image optimization that I will be working on soon. Below is a helpful post with some ideas on how to optimize your site speed. What if I Failed Google’s Mobile-Friendly Test? If your website did not pass the Google Mobile friendliness test then you need to come up with a plan of action. 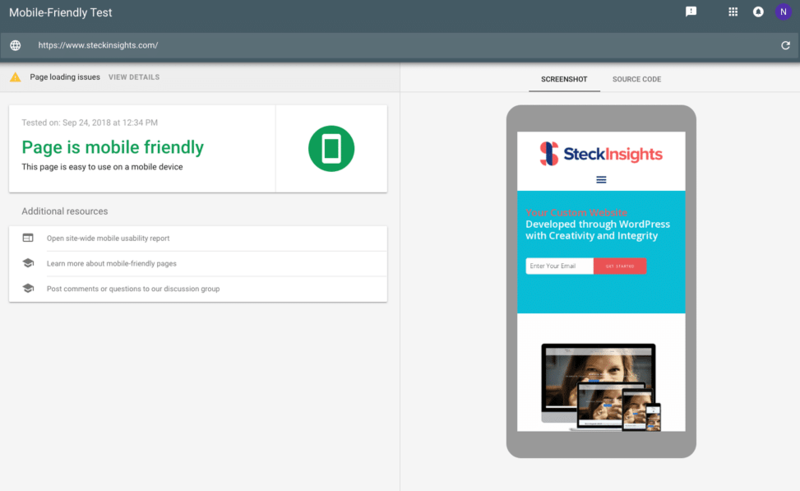 Website owners who do not follow Google’s advice and optimize for mobile will be left behind and we here at Steck Insights do not want that to be the case for you. We are skilled at creating mobile responsive websites. Please contact us if you need to optimize your website for mobile, we would love to help. Google is telling us with the mobile-first indexing change that user behavior is moving to mobile and if we are going to listen to anyone online it should be Google. I will let Google have the last words, “Mobile is changing the world. Today, everyone has smartphones with them, constantly communicating and looking for information. 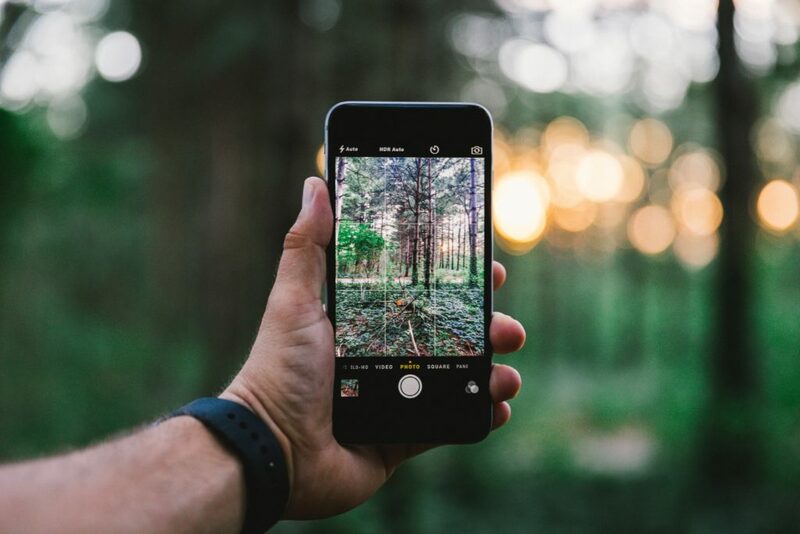 In many countries, the number of smartphones has surpassed the number of personal computers; having a mobile-friendly website has become a critical part of having an online presence.